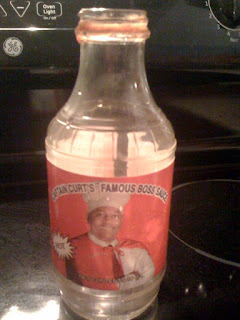 As the cliché states, "all good things must come to an end" - and tonight saw the end of the bottle of unholy deliciousness as the last few succulent sweet drops of Captain Curt's Boss Sauce trickled out of the vessel that my brother sent me back over the summer and onto a couple of plump Foster Farms chicken breasts, sizzling on the Weber. The bombastic blend of (among others) water, high fructose corn syrup, tomato paste, cider vinegar, hickory smoke, MSG, sodium benzoate (preservative), proprietary herbs and spices is all but a memory, having been a central part of many summer BBQs. And since it's not widely-distributed outside of the Chicago area, I guess it's time to have my mom mail out a bottle. Because what is Thanksgiving dinner without healthy side of heaven? The sauce was indeed boss. EDIT - Crisis averted, mom emailed this morning, letting me know that two precious bottles are in the mail. Thanks ma! My dad still sends me the periodic "Redneck Care Package" from my home in Alabama. It usually contains just random southern foods, largely creole/ cajun stuff you can't find out here, but sometimes has regular old redneck foods like great grits and odd BBQ sauces. Lemme tell ya' when some of those bottles or boxes empty out, I weep a little for "home". Sorry- we don't have fried cheese curds or pike-on-a-stick around here, but they sure are good. I might have a sauce for you to rival Boss Sauce.... hey GL'er, let's hang out after the chopper mayhem subsides this weekend. have a good weekend.